The interview took place December 18, 1994, backstage after his solo performance at the Spectrum in Montreal. I’ve been listening to his records since the 1960s. I had seen him in performance three times previously : in 1972 in Vancouver BC (opening for Dr. John the Night Tripper) ; in 1973 in Boston at Symphony Hall (opening for Jesse Colin Young) ; and in 1991 in Montreal at McGill University. 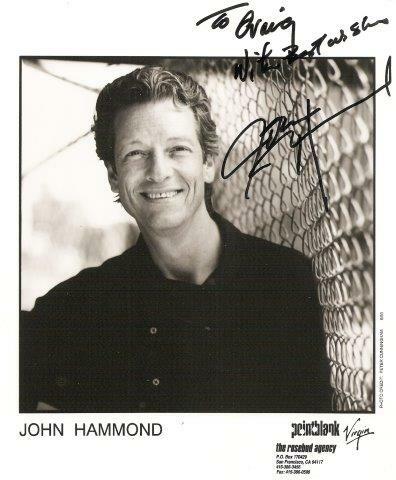 John Hammond, also known as John Hammond, Jr. and John Paul Hammond, made his first album in 1962 and, as of 2014, has made 34 albums. He was born November 13, 1942, in New York, NY. John Hammond’s website is here. An article on him, including a discography, at wikipedia is here. An extensive illustrated discography is here. For this concert, Hammond switched between acoustic guitar in regular tuning to National guitar (a resophonic acoustic) which he played with a slide, using open E, open G, and open A tunings. 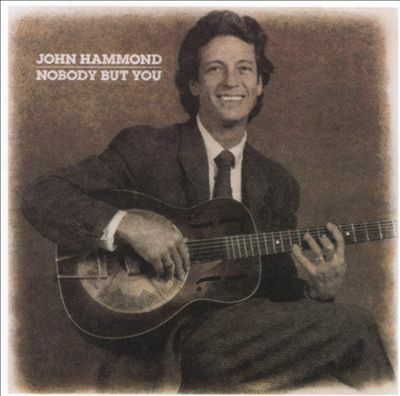 On many songs, Hammond’s expressive harmonica playing, sometimes in an emotional squealing high register, added a beautiful counterpoint to his singing and guitar playing. Besides the song titles, I have indicated the recorded source, and a few of my comments or snippets of the lyrics. The venue was full, the audience attentive, and Hammond gave a masterful performance. The lighting helped the mood, with spotlights (magenta, purple, or yellow) shining down, side lights, and John Hammond in a tent of white light. Craig Morrison : How has the tour been going ? John Hammond : It’s the end of the tour and end of the year and so it’s nice. It’s been a really long year, we’ve been all over the world. It’s been really great. CM : What were the highlights ? JH : God, there’s so many. We’ve been over to Europe five or six times, we’ve been all through Australia and Brazil and Alaska, all through Canada and all through the US. CM : I want to ask you about a couple of tunes that you did tonight. There’s one, I think it’s called “Mother-In-Law Blues.” I’ve heard Johnny Winter do it, also Jack DeKeyzer. Whose tune is that ? CM : And what about “My Time After A While” ? JH : It’s written by Bob Geddins and someone. I got the song from Buddy Guy, so I thought that he wrote the song, right ? [Buddy Guy recorded it on Chess in 1964, credited to Geddins and Ronald Dean Badger.] Most people think [that] who they hear do it, they wrote it. CM : Who’s Geddins, do you know ? JH : I met Bob Geddins. I was playing at a festival in Sacramento and I said “I’d like to do this Buddy Guy song” and I played “My Time After a While” and when I got through playing, you know, everybody liked it. But this guy walked up to the edge of the stage and said “excuse me, I wrote that song, not Buddy Guy !” I looked down at this older black man, very elegant, and I said, “I’m sorry, I didn’t know.” He said, “My name is Bob Geddins.” I said [into the mic], “Excuse me, that was by Bob Geddins, and he’s right here !” That’s how I found out. CM : What a great moment ! JH : You come to find out who wrote things. CM : One of the tunes I especially liked tonight, and I remember liking it when I saw you at McGill four years ago, is “Mama T’Aint Long Fo’ Day” by Blind Willie McTell. It’s so lovely, those little slides, it just goes down so nice and slow. I’ve studied a lot of this music. I’m a guitar player too and I give a course at McGill called History of the Blues. JH : Oh that’s great ! 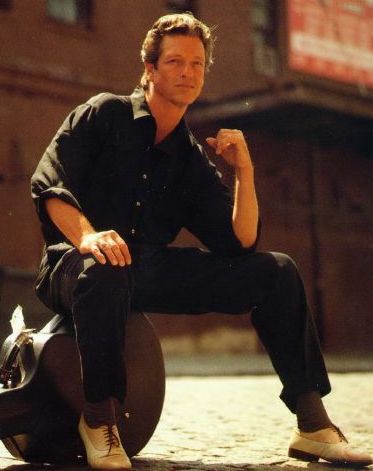 CM : I also give courses on the Beatles and on ’60s music and other things, but this is, I think, my most popular course. We just ran another version of it. I get to talk about you and I’ve got a nice video of you, a black and white clip of you doing [Robert Johnson’s] “Terraplane Blues.” I don’t where it’s from. JH : Well, I did a documentary film on the life of Robert Johnson. I don’t know if you’ve heard of that. It’s called The Search for Robert Johnson. CM : Is that connected to Peter Guralnick’s book [Searching for Robert Johnson : The Life and Legend of the "King of the Delta Blues Singers"] ? JH : No, it’s an independent documentary film made by Chris Hunt [director] and Caz Gorem [associate producer] in England. CM : I have seen ads for it ; I haven’t had a chance to check it out. JH : Check it out. I played some and I also narrated a documentary on his life. I talked to guys he grew up with. CM : How did that feel ? JH. Oh, it was wild. Old girlfriends, relatives of his. It was really interesting. Small budget but these guys had done their homework. I spoke to this guy Mack McCormick, who had done the original research, and he hadn’t spoke to anybody in more that 20 years. CM : I know about him. He’s got a lot of stuff that he’s been sitting on. JH : He, for the first time on camera, spoke about Robert Johnson, spoke about having met the man who killed him. I mean it was like, chills up your spine ! This thing came off real good ! 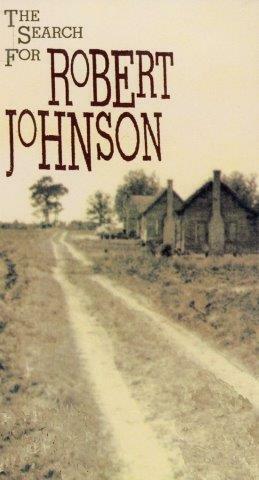 I learned more about Robert Johnson than I ever wanted to know. All I knew was that he was the greatest player, but to find out all the grisly details of his death and the kind of lonely time he had. He was way ahead of his time. CM : Absolutely. From what I read he was your spark for getting into this. JH : Mmhmm. My inspiration, absolutely. CM : You did about six of his tunes tonight. JH : I always do. CM : Well they’re great tunes ! JH : I know, you can’t go wrong. CM : When you do a song like “Mama T’aint Long Fo’ Day” or a Robert Johnson song like “Preachin’ Blues”… I’ve listened to those guy’s music so much sometimes I feel like I know these people. Of course, you just know bits about them. JH : Well, I feel like they’re my songs. I’ve been playing them for 32 years, you know. CM : Well they are. JH : So when I do these songs, they’re my tunes that I do my way. I mean I’ll acknowledge where I got the songs from, they’re within the parameters of what I’ve heard. But when it gets done my way, it’s my tune. At least that’s the way I look at it. 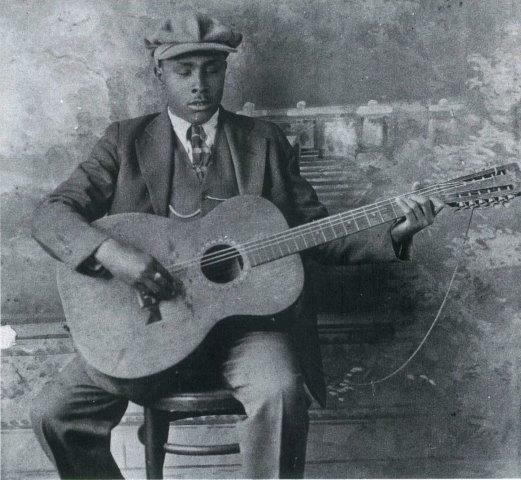 CM : Do you have a feeling for, say, who Blind Willie McTell [pictured] was as a person ? JH : Oh, I feel like he was a good friend of mine. All these songs that I do, I’m so inside of the song after all these years that I feel I relate to what was happening that day. CM : It’s like the spirit sort of gets evoked and floats around up there in the purple light for a while. JH : Well stuff comes through me I know, when I’m on the stage. I don’t know where it comes or how and I don’t question it. I just let it happen. I don’t plan a set, I just go up there and play whatever I feel like playing. CM : There were some tunes tonight that were very special, and one moment when you reached out your hand there. Did you have some highlights tonight ? JH : Oh man, every tune ! I was just amazed that so many people could be so quiet on the slow songs. I had all my dynamics in gear. They really let me be myself. It was wonderful. I wish every night was like tonight, it was just so great. The sound here is so beautiful and so professional. It’s a wonderful place. JH : This is a special place. CM : With those little starlights on the curtains on the side there. CM : That feels good. The first time I saw you was 1972, you were in Vancouver [British Columbia], opening for Dr. John and you had a black bass player and a black drummer. I don’t know who they were. JH : Oh, right. It was Charles Otis, and let’s see who I had at the time on bass ? It was Lee Collins, Charles Otis, and myself. CM : That was a great show. And the next time I saw you was at Symphony Hall in Boston in or ’73. CM : There were three or four other people on the bill. I mentioned this to you the last time I saw you. That was the time you did an encore and it was that country song about angel wings. JH : “Easy Loving.” Oh god. CM : That was nice. I liked it ! JH : You know, I like all kinds of stuff, and every now and then, if I’ve had enough to drink or I’m just in the mood, I’ll just do something completely different. CM : Yeah ! Where did you get that song from ? JH : From being on tour with a band called Poco. CM : Oh, of course. JH : Back in those days and we’d stop in these country and western-type bars. I remember I was on their bus for a while, so on these jukeboxes was this big hit called “Easy Lovin’” by Freddie Hart and the Heartbeats. I just thought it was so cool. CM : It’s a cool tune ! JH : Yeah, so corny and yet the way he sings it, it’s got so much feeling in it. For whatever reason I just learned it. CM : There’s one other thing I thought to tell you tonight. 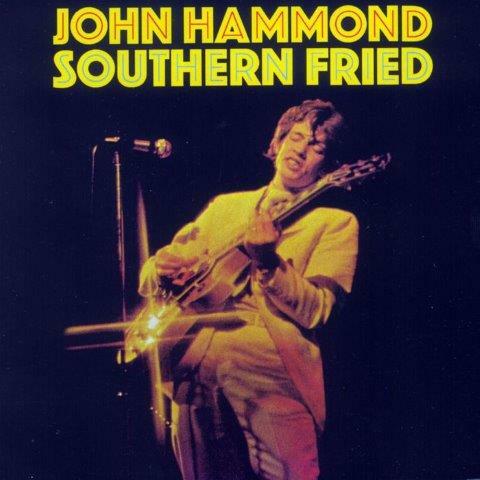 I’ve got your Southern Fried album. I think it’s a great album. JH : Oh wow, that’s a long time ago. CM : It’s from that album that I learned how to play [Chuck Berry’s] “Nadine.” I was out on the road in ’74 with a big horn band [the story of that tour is here], doing Chicago and Blood, Sweat and Tears material, and I was the rootsy guy in the band. So let’s do some of that : “what are you doing ?” “It’s rock and roll !” It’s your arrangment that we did with the horns, and it was really cool to hear you doing it tonight. JH : Ah well, thanks. Well, that was a magic time. This was 1969, I was with Atlantic. CM : Was it at Muscle Shoals [a famous recording center for soul music in Alabama] ? JH : Yeah, but I was sent originally down to Memphis to the Stax/Volt studios and Tommy Cogbill, a bass player, was going to produce an album on me. I was there for about a day and a half, and I just couldn’t communicate with the players there. For whatever reason, it wasn’t going anywhere, and I was real embarassed. I called Jerry Wexler back in New York. 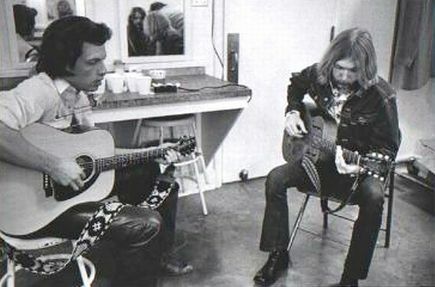 I said, “Jerry I don’t know how to tell you this, but it ain’t gonna happen.” So he said, “that’s alright, that’s alright. We’ll send you down to Muscle Shoals and Marlin Greene will [produce]. Don’t worry about it.” Jerry Wexler had never even heard me play other than on a recording. So then I went in to Muscle Shoals and they had the guys that had played behind Aretha, Wilson Pickett, all of them. CM : The heavy dudes. JH : And I was expecting them all to be black guys and they were all redneck white guys. CM : Was Jim Dickinson one of them ? And then this guy drove down from Macon, Georgia, in an old milk truck : Duane Allman. Walks into the session, and everybody says, “Hey Duane ! How you doin’ man ?” Duane was these guys’ idol. I’d never heard of him. “Hey where’s John Hammond, I come all this way to meet John Hammond, man I really dig this guy.” They all looked at him, and its like, “do you ?” “Hell man, you ever heard this guy play ?” And he went on. So he introduced himself. He was just a great guy, right away I liked him. And he said “man, would you mind if I sat in ?” All of sudden these guys knew exactly what I meant. All the songs went like this [snaps fingers twice]. Just because of Duane. What a catalyst ! So incredible. CM : What a nice thing. JH : It turned out to be a great session. It was the last album I did for Atlantic ’cause the next year I got asked to do the soundtrack to Little Big Man, the film. And in order to do that I had to sign a contract with Columbia, so I went from Atlantic to Columbia. I did the soundtrack to this film and some more LPs. But that’s how Southern Fried came about ; I felt like I was going to be fried down there, after all those days of nothing happening. CM : Did you see the Levon Helm book [This Wheel’s on Fire : Levon Helm and the Story of the Band] ? There was some stuff about you in there. JH : Yeah, I heard about that. He’s quite a guy. CM : They played here almost exactly a year ago when the Band got back together again. You recorded with some other Toronto guys. JH : Yeah I made an album about five years ago called Nobody But You and that was with Paul James, Terry Wilkins, and Buckey Berger. CM : That’s the famous rhythm section. JH : And Ken Whitely, Gene Taylor on piano, and it came out great, and we made it on a shoestring. Point Blank, the label I’m with now, has actually bought that album from them and it’s come out it on reissue. CM : The Whitely Brothers did a really nice album called Bluesology, did you hear that ? CM : He’s done a lot for the music in Canada with all his albums, like Junior Jug Band. It’s like : give it to the kids ; give it to the old folks. So driving back soon ? JH : We’re going to head back to New York. We’re going to be up to our ears in end-of-the-year stuff. It’s just a nice time of year to be home and relaxed. We have two more gigs but they’re near home. CM : You can go home to your own bed probably. JH : You got it. So that’s what’s going on. Next month we’re going to record a new album. CM : Well, thank-you, I won’t take any more of your time. I have posted interviews with members of the Doors, Electric Prunes, Iron Butterfly, Jefferson Airplane, Moby Grape, Music Machine, Quicksilver Messenger Service, Country Joe and the Fish, Strawberry Alarm Clock, and Davie Allan and the Arrows. To go to the index page, click here. My interview with one of the Searchers is here.